Who’s been guilty of putting sun production on their face and hands but forgetting to do it for the neck and chest? Yes, you can add me to that shameful list of people who let their guards down (or are just plain forgetful) and are sometimes worse for wear for it. Thankfully I have time on my side and I’ve only forgotten the sun protection half a dozen time over the past year, but if I were to continue down this path I’m sure I’d be left with sun damaged neck and décolletage, the surest sign of aging even if my face has been protected all these years. This is where the guys over at Skinvigor8 comes in. Designed by Hollywood Emmy winning Makeup Artist Camille Calvet, Skinvigor8 is an adhesive pad to help you try and reverse the signs of aging by diminishing the appearance of wrinkles without having to resort to surgery. I was provided with one of these silicone pads late last year to try. 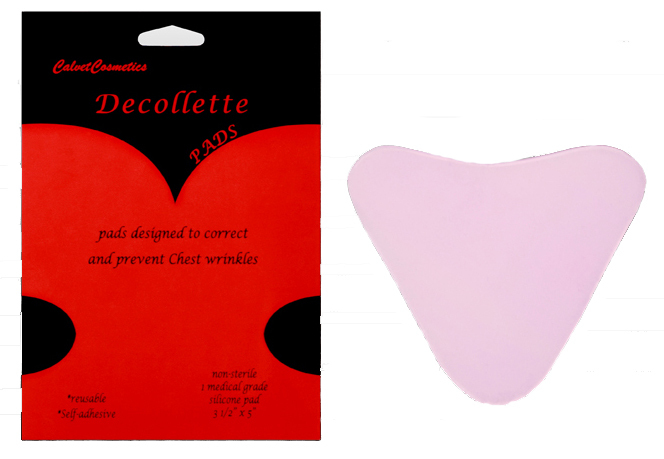 These medical grade silicone pads and are a rounded heart-shape adhesive that you can slap onto your chest area at night whilst you sleep. These could also be worn during the day under clothing but you would probably need to wear tops with a higher neckline to conceal the pads if you wore it during the day. Easy and straight forward to use - it was like sticking a piece of plaster onto clean dry skin, and once stuck, it doesn’t really move around, even during sleep which was good as I didn’t want it sticking to my sheets the next day. Surprisingly comfortable on skin, it wasn’t irritating, too sticky, too tight or too anything! In fact, I often forget I have it on. When removed doesn’t leave any residue on skin at all. On humid nights, my skin did feel slightly damp upon removing the pad but that’s just sweat trapped under the pad and it evaporates pretty quickly. These pads can also be washed and dried when it starts to get slightly dirty from use. The results shown on the skinvigor8 website looks amazing, but I’m sure there are many skeptics out there who wondered how long the user used the product for, whether camera lighting played a factor or if they had any help from other products as well. 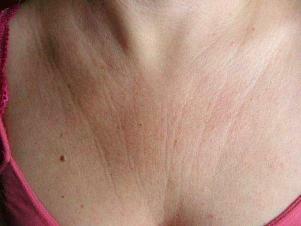 These pads are meant to correct and prevent wrinkles, so I’d dare say that if you have some deeper set wrinkles, you’re more likely to see satisfactory results than if you have shallow ones (simply because the improvements would be more noticeable) as the adhesive will help to support and strengthen the skin structure in that area over time. Without any real wrinkls on my 3-decade old chest, I personally can’t comment too much on its wrinkle removing effectiveness, which is a shame as I'm sure that's the aspect you'd be most interested in. There are, however some testimonies and before/after photos on their site that you can peruse to make up your own mind. For me, the pad acted as an overnight mask for the chest area. After use, my skin felt softer in the morning and the adhesive had a gentle exfoliating effect that help to keep skin clear and smooth. This was evident when I had a blemish there (don’t ask me why I had a spot there) and it healed much faster than normal without any medication at all. When I do have any signs of aging/wrinkles on my chest area, I’d definitely reach out for one of these adhesive pads. I would suggest anyone who is too scared or not quite ready for more drastic actions to give these a go too. In the mean time, I’m going to be more vigilant with slapping on the sunscreen on my neck, chest and back of my hand every time I’m out and would urge you to do the same. Each pad lasts 30-60 days and retails for RRP A$43 (ex GST) online at Skinvigor8 and selected retail stores Australia wide/ or US$28.95 at Decollete Pads in the US. This product was sent for review.